Have you guys been reading about Rene Redzepi and his inspiring restaurant Noma? I was wowed by his enviable foraging and thoughtful approach to food in this New Yorker article. Then, when I saw Bon Appetit's piece on the home-cooked meal he and his wife made for David Chang, I knew their Walnut Cake recipe was one I needed to try. Nuts are essential to our pantry. Give us pistachios, pecans, pine nuts, marcona almonds and we'll toss them into salads, porridge, and pastas. And of course nuts are a quick and easy snack any old time. Whenever I stumble upon an interesting recipe that bakes with nuts, I feel compelled to give it a go and am rarely disappointed. We noshed on Redzepi's cake for days. It works not just for dessert, but also for a nice tea, or even breakfast. Topped with a dollop of whipped cream, a few berries, or a smear of Kumquat Marmalade, this nutty cake made me extremely happy! Notes: Keep in mind that this recipe feeds quite a crowd - considering the richness of the ingredients, a little slice is all you need. Next time, I'll try cutting the recipe in half. *Also I have been trying to avoid most sugars lately, thus I have adapted the recipe to use honey and coconut sugar - both great flavors that worked really well with the walnuts. Preheat oven to 350. 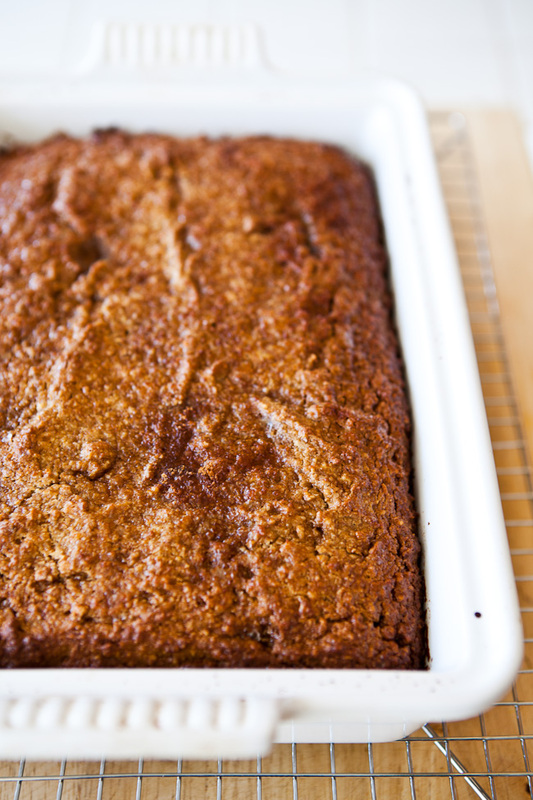 Prepare your 13x9x2 inch baking pan by sprinkling 3 tablespoons of coconut sugar evenly over the bottom of the pan. Set aside. Coarsely chop 2 cups of walnuts in a food processor. Set aside. Coarsely chop the remaining 5 cups of walnuts in the food processor. Add the flour and pulse the processor until the nuts are finely grounds. Add almond meal. Pulse to combine. 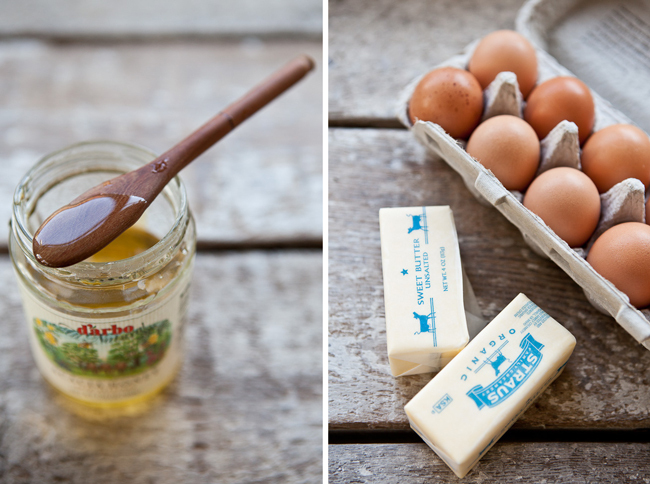 In another large mixing bowl (your Kitchen Aid Mixer, if you have one) beat butter and honey together for a few minutes until light and fluffy. Add eggs, cream, yogurt, salt, and vanilla and mix ingredients until well blended - another minute or so. Add finely ground walnut/flour/almond meal mixture to the sugar/egg/butter mixing bowl. Stir to integrate ingredients. Finally, fold in coarsely chopped walnuts. Pour batter into prepared baking pan, smoothing the top with a spatula. Sprinkle remaining 3 tablespoons coconut sugar evenly over the top. Bake for 50 minutes to an hour. Test for doneness with a toothpick. When the toothpick comes out clean, your cake in done. Set aside cake to cool on a baking rack. Redzepi suggests placing the cake in the refrigerator and serving chilled. Divine! I desperately want to give this one a try (maybe in a loaf pan as a sort of breakfast bread). Actually, I was thinking of your kumquat marmalade this morning when I picked up a gorgeous little kumquat and walnut upside down cake at Sweet Adeline's. Bet that marmalade would be fabulous spread on your walnut cake. Allison, I think the cake would be really nice in a loaf pan. A sliver for breakfast... yum! So funny about Sweet Adeline - same flavors. Thanks Rosa. Yes there is something about the walnut/kumquat paring that I am crazy about! If only I lived a few growing zones warmer, I'd be able to grow an orchard full of nut trees, or I suppose just hunt for them in the wild. How wonderful it would be! I agree with that article, foraging is indeed a treasure hunt - and one at which you always win, if you know where to look! Isn't the article on Redzepi inspiring? I find foraging to be so deeply satisfying. An orchard of nut trees?... what a dream! This looks so good! I think the walnuts are missing from the list of items & quantities in the recipe, though? OMG Sarah! Thanks so much for catching that. I just fixed the ingredient list. It calls for 7 cups of walnuts - very important:)! WOW 7 cups! Yep I'd say that's an important one, eh? :) Love your blog & all your pics btw. I love walnuts in any form and this cake(with 7cups of walnuts!!!) sounds delicious, seems to be easy to make, too. love the ingredients shots, so pretty. M, Can you believe that... 7 cups. If you go organic like I do, the cake gets pretty pricy. But I think it would be great for a big party. It can easily feed a couple dozen people. And it's really simple. I think the recipe is a fun base to play around with. Oh, just lovely Erin. I think you and I are continuing to travel in the same food craving circles. I love a simple cake more than any other sweet. We've been watching so many BBC Masterpiece Classics and they always have such simple earthy cakes that they serve. Like you, we've had enough for afternoon snack ALL week. Sarah, I know... when I saw your beautiful gateau today I knew we were on the same page once again. I think the molasses you used could be really nice in this recipe too. And I am so loving Downton Abbey - it's addictive! What a fantastic looking cake. I love nuts too, so this is one to try. 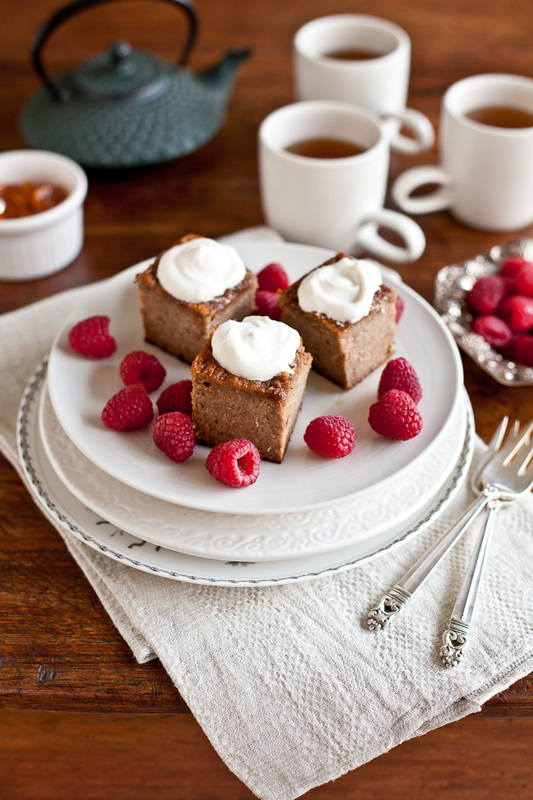 I also love your use of coconut sugar. I've been wanting to give it a try for a while now, so this might be the recipe to introduce me. Jennifer, I hope you do try the coconut sugar - I think you'd love it. It has such a nice caramely flavor and it has become one of my favorite ingredients! What a beautiful cake! I can imagine that it would be quite delish yet very dense and packed with flavor. I can understand why you would cut the recipe in half. With that yummy marmalade you made, this is a winner! Hope you have a wonderful weekend ahead! Lisa, I hope you have a great weekend too! I'm loving all the sunshine. I was literally just reading that article a few minutes before turning on my computer. I was all "omg that walnut cake sounds amazing" and I guess you thought the same thing! Gorgeous! I finally read through Bon Appetit's March issue while traveling this weekend (and then I read it again and again). So much inspiration! I'm eager to try substituting pecans for the walnuts and I'm excited that you used honey instead of sugar with success. Yes! Kate, I have really been loving Bon Appetit lately. SO many tempting recipes! I bet pecans would be delish here! I love cakes made with nuts and this looks absolutely delicious - and not the usual coffee and walnut type cake that you see everywhere! The honey I used was really light and mild and didn't make much of a statement. But I think I nice rich dark honey (or even a little molasses) would be delicious in this cake. Hi Erin, I'm going to try this soon! I also use coconut sugar here for a lot of baking and raw desserts too. This post is close to my heart as Mark and I had our wedding lunch at Noma in 2004 when we got married in Copenhagen. The resturant had been open only 3 months and were literally the only customers there, us and two friends, outside table on the harbour and it was divine! OMG Meredith, That is so cool! What a lunch you must have had. Have you been back again? I miss you, Mark and Lakota, and hope you guys are well! Fabulous cake. I should try it with almonds or pecans and coconut creme. Too many no no's for me in there just yet but sounds devine. I can almost taste it. Ahhhh and I do love coconut sugar too. Oli, If you do try the cake with substitutions, I'd love to hear.I think the coconut cream could be especially interesting. 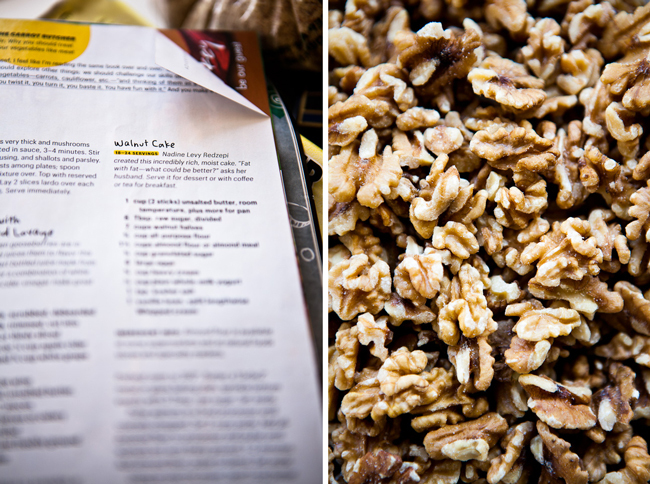 I love any cake that's loaded with ground nuts and I'm imagining how good the honey would be with those walnuts, yum! Honey and walnuts are made for each other aren't they! What a beautiful spread! Your food styling is great. With 7 cups of walnut halves...this must have tasted HEAVENLY! I'd love to have this for breakfast...lunch and in between meals too. Looks really yummy! MyFudo, that is exactly what I did with all the leftovers of the cake. It really was good! This is one beautiful cake--I love everything in it. Fab pictures, too! 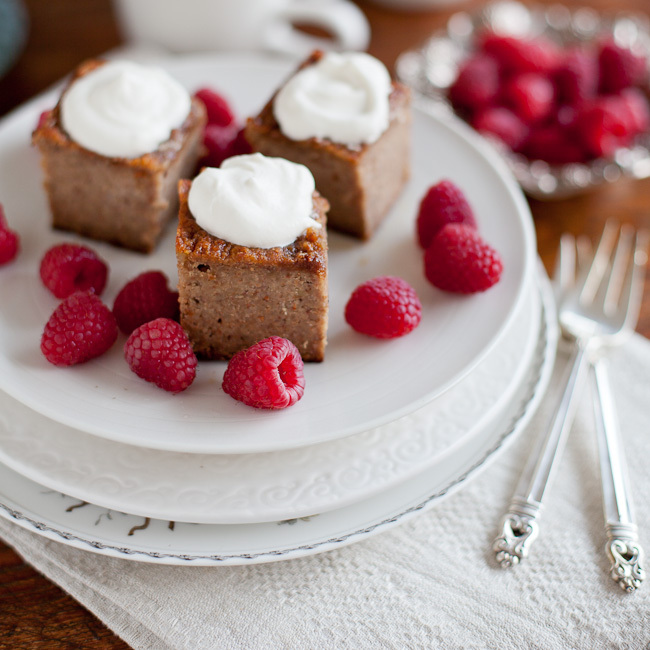 Beti, I really love almond cakes of all kinds and it was fun to have the walnut-y flavor and texture here. Nuts really are great in baking, aren't they? I was just reading about Redzepi and Chang cooking together. So interesting. The texture of this cake looks amazing! Wish I could have a piece with my tea right now. Beautiful, it reminds me of my mother's nut cake. I was completely smitten by that article in Bon Appetit. I've been eyeing this walnut cake for weeks, and keep reminding myself that I need to stock up on walnuts so I can make it...I was also fascinated to learn that he and his family primarily eat vegetarian-driven meals (for some reason, when I think of Noma I think of serious meat-eating!). Lovely post and photos! Kasey, I loved that Bon Appetit story too! Didn't you just wish you were at the table with them? So so so lovely! And I love that you adapted this to use less sugar. It still looks and sounds delicious. Looks so moist and rich! (Just what I look for in a cake, and hard to find) Damn that husband of mine with his egg allergy! Hey there two Rachels:) The honey did work really well here. And I'm so sorry about the egg allergy - not fun! I loved that Bon Appetit article too! Great photos! oh hey i hope i'm not too late to this discussion!